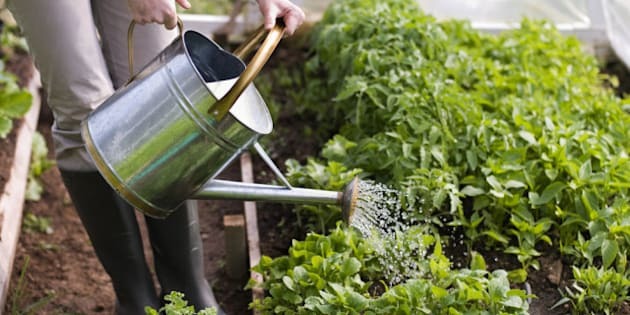 When To Water Your Plants: Should You Garden In The Morning Or Evening? TORONTO - The hot days of summer have settled into many areas of the country. Add a lack of rain into the mix and gardens are wilting under the soaring temperatures. Gardeners who did a lot of back-breaking work in the spring and spent money on plant material may be dismayed to see their investment withering. But the solution is relatively easy — proper watering is key to preventing your plants from becoming scorched, says gardening guru Lindsay Drake Nightingale. Water evaporates quickly when it's very hot so she advises watering containers and gardens in the cool of the morning or evening, though she prefers early morning. "It gives you a chance to enjoy your garden at its best — it's always really nice in the morning — and then the garden appreciates it if you water it first thing. It's better for the plant material too. It can absorb the water easier if it's not so stressed by the heat," she said. Plants become perfect fodder for pests in the heat because they become more tender with lack of water absorption. Another advantage of morning watering is that "you can spot the pests and it's easy enough to pull a snail off of your hosta or slugs off of whatever or other nasty things that are out there eating your plant material," Drake Nightingale, 50, said in an interview from Newmarket, Ont. Bump up watering to twice a day — morning and evening — for newly planted material, including young trees, and make sure water goes into the soil surrounding the plant rather than on its foliage. "This gives it a chance to establish its roots and survive the heat," said Drake Nightingale, owner of Yorkshire Garden Services, a small firm specializing in garden care, renovation and containers. Water just until the soil is damp to the touch and not so it is pooling on the soil's surface. A hose with a nozzle that showers is the best way to give plants a drink. Soaker hoses and drip irrigation systems work well too. She only recommends using an oscillating sprinkler if the space is wide enough — there's no point wasting precious water on the sidewalk or driveway. Water for about 20 minutes. But keep an eye on it to ensure the soil doesn't become saturated, causing run-off. The contents of rain barrels can be used to water containers and other plant material. Concentrate on watering perennials and annuals. "Just with the nature of lawns they do tend to go dormant and then as soon as the cooler weather comes they start to green back again with a little bit of rain," Drake Nightingale said. "Annuals tell you when you haven't got enough water on the garden because they wilt instantly. But they come back almost instantly with watering." Some heat-tolerant annuals are petunias, marigolds, snapdragons, zinnias and dahlias. "Portulaca is so colourful, so beautiful, spreads nicely and blooms constantly," she said. "You can put it next to the sidewalk and it doesn't burn. It's so hardy it takes like a sledgehammer to kill it." Drake Nightingale also likes dragon wing begonia and annual euphorbia, which can withstand hot dry conditions. Any of these can be used as infill where spring perennials have died back. "You lift up mulch and it will be nice and damp underneath and that's a great environment for plants to have their roots stay cool and stay damp," Drake Nightingale said. It also holds the weeds back. "Weeds are so prevalent when there's moisture so the spring is always weedy, but at this time of year they tend to die back a little bit. That's the advantage of the hot weather." Rain will run off smooth compacted soil. Gently turning soil will help keep moisture where you want it. Xeriscaping is a type of gardening that avoids relying on the need for supplemental irrigation, using plants that nature intended for an area's climate. The advantages are that the garden becomes low-maintenance and the type of native plants used will thrive during drought periods. "It's a different look," Drake Nightingale cautions. Many gardens are based on ornamental plants that have been brought in from Asia and southern countries whereas with xeriscaping there might not be any blooms for a period of time when native plants die back. "A lot of native plant material repels insects more readily so it's more tolerant to our environment and the pests that are here," she added.